When I first had ideas for writing a magical fantasy set in the Old West, I considered several options for how far to go with the fantasy elements. I could add wizards to the social fabric and call it good, or I could add fantasy races and creatures as well. I decided to do it all. I’ve read many forum discussions about whether or not fantasy writers should include classic races such as elves or dwarves. Some people are bored with them while others can’t get enough. The bottom line for me is that anything goes as long as you do it well. If you are going to write about dwarves and elves, make them your own. And that’s exactly what I did. Any fantasy reader who reads my Western Geomancer series would instantly recognize the delvans I created as having been based on a classic dwarf. They are stocky in build, tend to have facial hair, and they spend a lot of time underground. But from there, I did plenty of tweaking to make them my own. The term “delvan” originally came from a twist on the word “delving” (to delve is to dig or excavate.) The grammatical variations are similar to the word human, with delvan as the singular and adjective forms and delvans as the plural form. For example: he is a delvan; this is a delvan rock hammer; and those delvans seem annoyed. Physically, delvans differ from classic dwarves in that they are an albino race, thanks to millennia of living almost entirely underground. Their pink eyes are extremely light sensitive, so they generally visit the surface only at night. When it is necessary to travel during the day, they wear tinted goggles (aviator style) to protect their eyes and long clothing to protect their pale skin. In Geomancer’s Bargain, the popular style for above-ground delvan attire is a loose-fitting grey robe with long sleeves and a deep hood. When underground, they wear thick linen clothing and a leather helmet that serves as a hardhat. Delvans are resistant to magic and largely uninterested in it. Few delvans have attempted to cast a spell, and none have succeeded. However, delvans are born with a few innate elemental magic abilities. They have an excellent sense of position within the earth, knowing approximately how far they are below the surface and where they are located relative to the rest of their tunnel system. Delvans can also smell precious metals, such as gold and silver, when the materials are present in sufficient quantity. Unlike the dwarves from Dungeons and Dragons, delvans do not have “infravision” that allows them to see in total darkness. Their eyes are very sensitive to light, but they still need some light to see. They illuminate their underground habitat sparingly with candle lanterns. Delvans and humans generally get along and build cooperative communities that consist of a human town and an affiliated delvan “subtown.” Centuries ago, delvans and humans warred constantly, but relations have been relatively peaceful and mutually beneficial for the past three hundred years or so. Everything goes smoothly as long as humans, who the delvan often referred to as “topsiders,” keep to the surface. Humans are happy to oblige, leaving subterranean “delvan work” to their albino cousins. When gold was discovered in the West, delvans handled all of the hard-rock mining while humans transported and processed the ore.
Delvans govern their own communities. Large communities elect a headperson who is supported by three alderpersons. The community leadership cooperates with local human communities, particularly with regard to medical and legal matters. Delvans have their own religion based a holy trinity. Mother Earth rules the surface of the planet and makes things grow. Father Earth rules the underground, providing safe haven and giving Mother Earth a medium with which to nurture life. The stars in the heavens are their children, the Sky Children. Most delvan’s worship Father Earth, who gives them a home and protects them from the perils of the surface. Although delvans need Mother Earth for sustenance, they visit her domain while she sleeps at night. Among the delvan, the sun is known as Mother’s Light. Delvans strongly believe that the underground world, which they have often carved out with their own sweat and blood, is their domain. Most have little sympathy for humans who visit their communities and complain about the low ceilings and lack of illumination. Topsiders should remain topside. Similarly, delvan disdain for magic results in a bias against all kinds of magic users, particularly earth wizards (geomancers). The most religious delvans believe that earth magic is sacrilege and a misuse of Father Earth’s divine power. The setting for Geomancer’s Bargain is a small mining community in the Arizona Territory. A small group of delvan miners work a gold and silver mine called the Commonwealth, while the human population that supports the mine lives in the nearby town of Pearce. Within the mine, the delvans have carved out a small living space called Commonwealth Subtown. 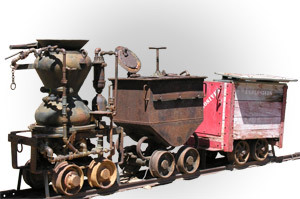 The delvans mine the ore and bring it to the surface where human teamsters take over and transport the ore to a railroad depot. At the start of the story, the delvans learn that the mine manager has hired a human geomancer to help increase production at the mine. Given delvan biases against humans underground and “earth wizards” in particular, our hero Carleton Kazimer, Wizard of Geomancy, steps into a hostile environment when he arrives to begin his new contract for the Wizard Guild. Geomancer’s Bargain tells the rest of that story.